Gardeners needing to regularly tackle challenging grass-trimming and vegetation clearance jobs in the domestic arena should take a good look at this super lightweight petrol brushcutter from Tanaka. Powering it is an advanced 22cc (0.9hp) Tanaka Pure Fire engine; a high-specification two-stroke power-pack that offers the sort of fuel-economy and emission-output you’d expect from a mini four-stroke unit, but with far less weight. Tanaka’s S-Start ignition system makes starting practically effort-free. 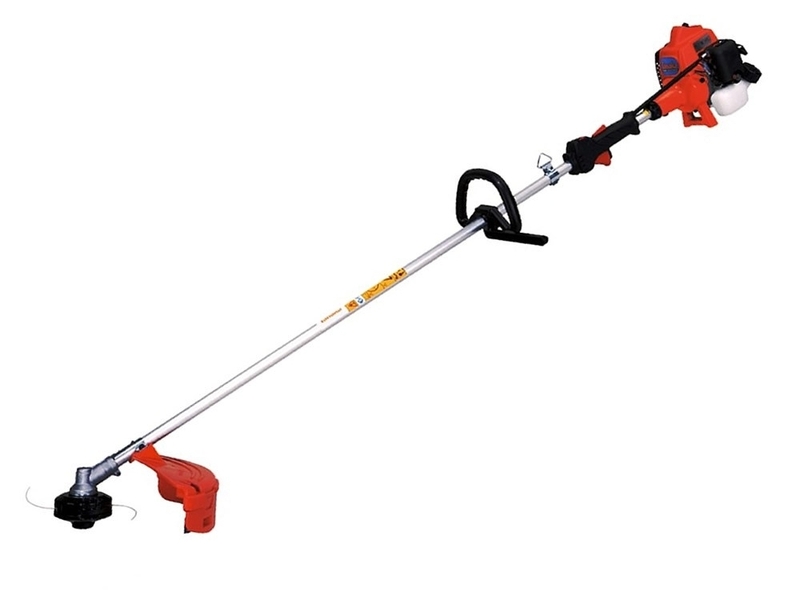 The Tanaka TCG-22EAS Petrol Brushcutter is ideally balanced; weighs a mere 4.4kg; and comes with a shoulder strap – a combination that makes it perfect for those more time-consuming jobs. An ergonomic ‘loop-and-bar’ handle delivers superior control and manoeuvrability; while a heavy-duty 24mm-diameter shaft confers exceptional durability (this model has a five-year home-use warranty). Also featured is a nylon-line cutter-head with a Tap ‘n’ Go mechanism that will see fresh cord fed-out with a simple tap of the head on ground.